Exhibitions Highlight Scholarship and Enduring Traditions. Battle scene. Silicone cast. Harvard Semitic Museum. Everyone is fascinated to learn about their family tree, or the amazing and complex contributions from around the world in their genetic background. 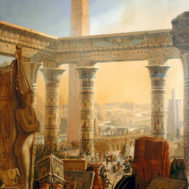 Where can you learn about the glories and accomplishments that make up your cultural history? Certainly, you can find information in libraries or on the Internet, but museums are where you access real objects, authenticity, and understanding of the contributions of all the peoples of the world to human culture. This month we highlight seven current international museum exhibitions that show objects from countries other than their own, to demonstrate how museums can contribute to our knowledge of global heritage by bringing often unfamiliar and distant art to public attention. 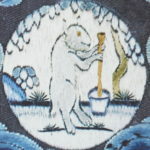 White Rabbit on the Moon, compounding the elixir of life. Qin Shihuang is thought to have poisoned himself by drinking a toxic mixture intended to grant immortality. 1. 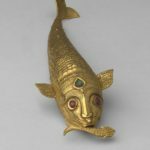 The Nelson-Atkins Museum of Art in Kansas City, Missouri is hosting Dreams of the Kings: A Jade Suit for Eternity—Treasures of the Han Dynasty from Xuzhou until April 1, 2018. Both New York City’s China Institute Gallery and the Xuzhou Municipal Museum in Xuzhou, China organized this exhibit. Li Yinde, director emeritus of the Xuzhou Museum, curated the exhibition, bringing together 76 objects in the museum’s collection from the royal tombs of the Western Han Dynasty (206 BC – 8 AD). The highlight of this three part exhibit – Court Ceremony, Feasting, Dance, and Ritual; Warfare and Authority; and Jade for Eternity – is a jade and gold burial suit from around 175 BC. Jade was so highly regarded and difficult to obtain that only kings and queens were encased in the material. It was thought to protect the body from decay and perhaps assist in the afterlife. This particular suit is composed of over 4,000 tiles bound with gold thread. It is considered the finest example of its kind. A recent discovery of ancient wooden slips in Hunan contained an executive order for a nationwide search for the elixir of life. China’s first emperor, Qin Shihuang is well-known throughout the world for the creation of a massive underground tomb in Shaanxi, containing nearly 8,000 terracotta soldiers. 2. Harvard University’s Harvard Semitic Museum in Cambridge, Massachusetts opened From Stone to Silicone: Recasting Mesopotamian Monuments in late December 2017. Harvard students and museum curators collaborated to recast 100 year-old plaster replicas of stone reliefs that once adorned Mesopotamian palace walls in what is now Iraq. The recasting process included first repairing the plaster replicas then covering them with silicone to create a mold. Resin was then poured into the mold to reproduce the reliefs that now adorn the Harvard Semitic Museum’s grand, third-floor atrium gallery until May 31, 2018. 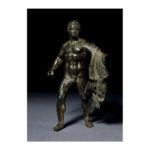 Bronze athlete, Agon, CaixaForum Barcelona. 3. CaixaForum Barcelona in Barcelona, Spain is featuring the competitive spirit of ancient Greece in its exhibit Agón! Competition in Ancient Greece. Black-figure vases, the Vaison Diadumenos sculpture, Greek armor, the Amazon Frieze, and other artifacts, all from the British Museum, in London, England – some on loan for the first time – depict the meaning of Agón, the ancient Greek word for contest or struggle. Whether they were warriors on the battlefield, athletes in Olympia, or philosophers in the debating hall, Agón was the spirit of competition. The exhibit is open until February 18, 2018. 4. Room 33, the Sir Joseph Hotung Gallery of China and South Asia in the British Museum, in London, England (formerly the Joseph E Hotung Gallery of Oriental Antiquities) opened last month, after almost two years of restoration, updating of displays, and contemporary perspectives on the art of China and the South Asian countries of India, Pakistan, Bangladesh, and Nepal. 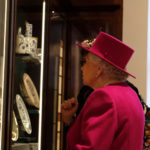 The Queen of England at the opening of the Sir Joseph Hotung Gallery of China and South Asia at the British Museum. Copyright Royal Communications. 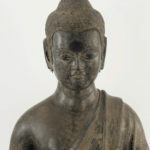 The renovation, with new lighting and environmental controls, has also allowed objects to be displayed that could not previously be shown among the textiles and paintings in the British Museum’s Asian collection. The reconfiguration also allows better viewing of some of the gallery’s most important artifacts, such as the reliefs from “The Great Shrine of Amaravati”, an important Buddhist monument early in Buddhism’s history. Both the China and South Asian displays are now configured chronologically instead of thematically. The earliest artifacts in the China section go back to 5,000 BC and the earliest in the South Asian section to 1.5 million years. The refurbishment was made possible by a generous donation from The Sir Joseph Hotung Charitable Settlement. Buddha; China, Tang dynasty (618–907), early 7th century; hollow-core lacquer with pigment and gilding; Freer Gallery of Art. 5. The Secrets of the Lacquer Buddha, an exhibition utilizing the tools of science to help us understand art, is at the Arthur M. Sackler Gallery of the Smithsonian Institute. Three lacquer Buddha statutes, from sixth and seventh century China, and one Bodhisattva head from the eighth century, were examined by microscope, x-ray, and gas chromatography to unveil their underlying composition. 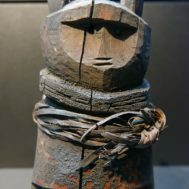 Researchers learned that in addition to resin over wood or clay cores, craftsmen also utilized burnt animal bone, sawdust, iron wire, oil, hemp fabric and, in the case of the Bodhisattva head, human blood, in the creation of the sculptures. Two of the three lacquer Buddhas are on loan from the Metropolitan Museum of Art in New York City and The Walters Art Museum, in Baltimore, Maryland. 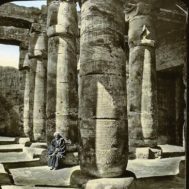 The third is part of the Charles Lang Freer Endowment, in the Freer Gallery of Art – a second gallery devoted to Asian art within the Smithsonian Institute. The exhibit continues until June 10, 2018. 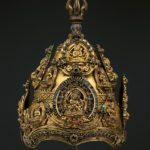 Vajracarya’s ritual crown, 13th century. Nepal, Early Malla period. Metropolitan Museum of Art, New York, Gift of Barbara and David Kipper, 2016. 6. The Metropolitan Museum of Art in New York City is also featuring a display of Buddhist art in its exhibit Crowns of the Vajra Masters: Ritual Art of Nepal. Five crowns, invoking the five transcendent Buddhas, are exhibited surrounded by 24 pieces of Newar ritual artwork and implements. Nepalese Newar Buddhism is unique in its practice of Vajrayana Buddhism in a few respects. One is that it continues to utilize Sanskrit as its ritual language in the manner of early Indian Buddhism, linking it to the earliest Buddhist practices that were themselves rooted in Hindu practice. Another is that the Vajracharya (literally Vajra teacher) of the Newar tradition is a hereditary position as opposed to a monastic one. Vajracharya priests are born into their role instead of electing to follow the Buddhist path as most Buddhist monastics do. The exhibit will be on view in Gallery 251 until July 15, 2018. 7. The Queen’s Gallery, Palace of Holyroodhouse, in Edinburgh, Scotland, presents Splendours of the Subcontinent: A Prince’s Tour of India 1875–6, a collection of dazzling works of art gifted to Albert Edward, Prince of Wales (later King Edward VII) by the courts of India during a four month trip to strengthen diplomatic ties between England and India. Gold fish ornament. The Queen’s Gallery, Palace of Holyroodhouse. This is the first time in 130 years that the collection has been on display. It was developed in collaboration with Cartwright Hall, Bradford, England and New Walk Museum & Art Gallery, Leicester, England. The exhibition forms part of the 2017 UK-India Year of Culture, a year-long program of events led by the British Council, in cooperation with the Indian High Commission. The exhibit is on view until April 22, 2018.